The special suite room has an 8-mat Japanese room, living area, two sets of twin bed, and high qualified bathroom equipped with a bubble bath and even TV inside. Beautiful view of Mt. Fuji and the Lake Kawaguchi can be seen from the bathroom. Room rate with dinner and breakfast per person is over ¥31,500 including tax and service charge, but excluding local tax for hot spring. ‘Zayou Suite Rooms’ are laid out 2 rooms on the 3rd and other 2 rooms on the 4th floor in the ‘Plaza’ house. A high standard bathroom equipped with a bubble bath and TV inside is laid out next to the bed room separated by the glass wall. A set of sofa, chair and table, arranged in the living & Terrace area, can be stored compactly in one piece. ‘Yukata’ (浴衣)　cotton kimono for bathing, and ‘Samui’（作務衣）or zen-style ware for sleeping are always prepared in various sizes in all guest rooms. A refrigerator with freezer box is arranged each in 6 suite rooms in the Plaza-kan House and 14 suite rooms in the ‘Tenbou-kan’ House. 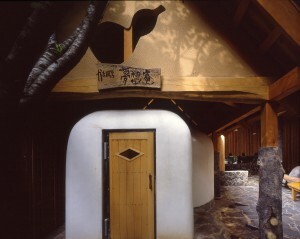 Guest rooms in the ‘Tenbou-kan House’ which was built in the 1st stage renovation were also slightly adjusted this time. ‘Ryukyu-style tatami’(琉球畳) covered floor was changed to original design durable synthetic resin mat as the same material used in this renovation project. ‘Tenbou-kan House’ has own club room on the 7th floor where all guests in the club floor can use freely. Free drink is served in the evening and morning. As a certified guide-interpreter in English and also a writer of the website “Cool Japan Guide”, I am very happy to introduce “Kaze-no-terrace KUKUNA” in Fujikawaguchiko Onsen. If you have something to ask, please feel free to contact us. Thank you for your kind cooperation, I am looking forward to your contact. ‘Kaze-no-terrace KUKUNA’ at the Lake Kawaguchi, Yamanashi started its 2nd stage renewal project in February, 2010 and completed it on July 17, 2010. 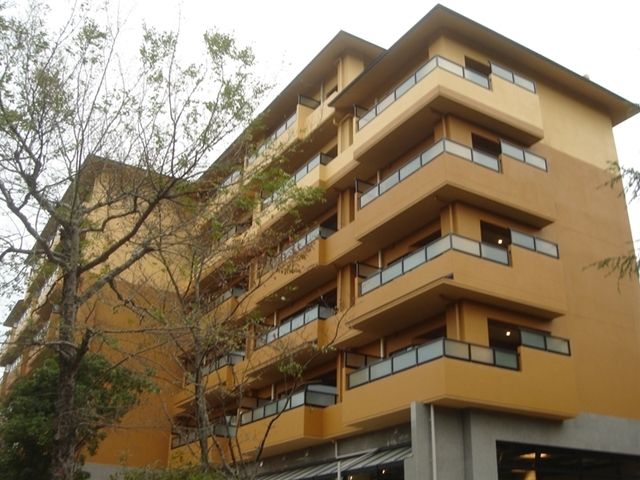 Total floor 7,564㎡ and 9-story building of ‘Kaze-no-terrace KUKUNA’ is stood on the lakeside of Lake Kawaguchi, where is about 10 minutes drive from the Kawaguchi-ko Inter Change on the Chuo Highway. The lakeside hotel was originally a typical Japanese inn called ‘Kawaguchi-ko Daiichi Hotel’. The original inn had stopped its business in November 2005 and started the 1st stage total renovation including new annex house with 14 guest rooms. 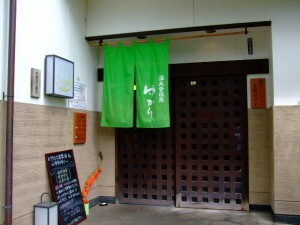 The typical old style Japanese inn was completely changed and reopened as a Western style resort hotel and renamed as ‘Kaze-no-terrace KUKUNA’ in November, 2006. Actually, 45 guest rooms in the ‘Chuo-kan’ and 6 rooms in the ‘Plaza’ were slightly changed on the 1st stage renewal project. This time, all interior decoration were completely removed from these rooms and furnished with new concept interior decoration. And also, public space ‘Hikari-no-terrace’ and ‘Aesthetic Salon Liko’ are newly added. The investment cost for the 1st stage renewal was 1,800 million yen, and 500 million for the 2nd stage. The main target of the 2nd stage renewal was how to remodel typical Japanese style 12 tatami-mat rooms to attractive and profitable rooms. New design concept ‘fusion of the easiness in Japanese room and conformity of the resort style’ was arrived as an answer after long consideration. Unique Japanese rooms named ‘Zashitsu’ and ‘Zayoushitsu’ are created under the new design concept. 20 rooms of the new concept room ‘Zayoushitsu’ are newly laid out in the ‘Chuokan’ house which can accommodate 4 guests. Bath room is not equipped but high standard shower both is laid out. A glass wall separates between bed room and shower both (equipped with sliding door) which provides wider look space. About 10㎡ of living area where used to be a ‘Hiroen’ (広縁) in the old Japanese room, is newly laid out this time. Original design durable synthetic resin mat covers the floor and automatic window blind is equipped for relaxation space. Amenity set including, milky lotion, cleansing cream, facial pack, mouth cleansing is newly arranged. A three- way mirror is arranged on window side according to advice by their lady guests for getting natural lighting. Room rate with dinner and breakfast per person is over ¥17,850 including tax and service charge, but excluding local tax for hot spring. Another type of new concept room named ‘Zashitu’ is also a remodel from an old 12-mat Japanese room. It has no bed in the room but provide wider living area. Sets of ‘Futon’ (布団) or sleeping mats are placed on living area when room guests get sleep. Both ends of ceiling are furnished with new material ‘Sakai Rib’ for expressing qualified design. High standard shower both is laid out instead of bath room. A glass wall separates between bed room and shower both (equipped with sliding door) which provides wider look space. Unique design of furniture, resembling to a set of sake pot and cups, is arranged on the window side which allows providing wider space when sets of futon sleeping ware are placed on the floor. A set of glass, cups for green tea, a teapot, and saucers are neatly arranged in a built-in type ‘Mizuya’（水屋）or cupboard. Room rate with dinner and breakfast per person is over ¥16,800 including tax and service charge, but excluding local tax for hot spring. ❶Instead of using natural straw ‘tatami’ mats, original design mats made of synthetic fiber covers the floor. ❷Replaced old bath unit with a shower both and washstand. ❸Automatic window blind is employed. ❹3-way mirror is arranged window side where sun light comes in. ❺Sets of tea and glass are neatly arranged in a built-in cupboard. ❻Soundproofing wall with lead plate inside and unique shaped interior material ‘sakai rib’ which gives high grade impression are equipped. ❼Lower height of 45cm beds are laid out. Mt. Zao Onsen Resort & Spa brings you to completely different world and it lingers on you unique imagery. 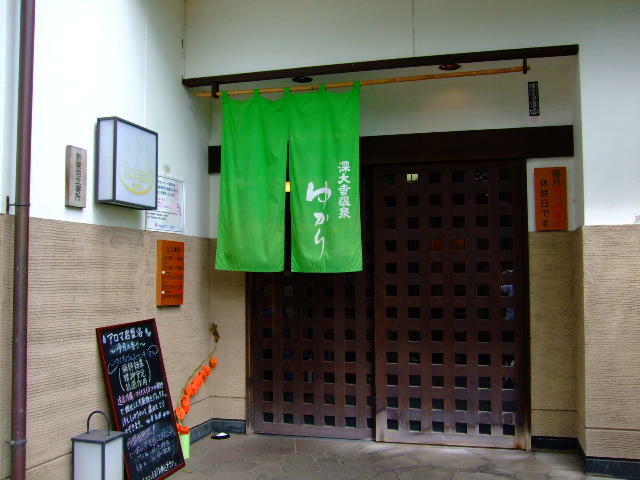 As the part two, I would like to inform a little bit about Onsen facilities of Chikusenso, Mt. Zao Onsen Resort & Spa including its attractive accommodations in detail. The resting area was one of the last temporary structures remaining from Tenzan’s opening in 1966. The old structure, located on the site near the erosion control bank in the Sukumogawa River, had used as private guest rooms for resting. 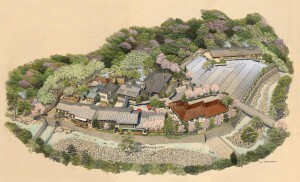 The Tenzan management planned replacing it to new style private Onsen area. A new two-story building was constructed in 2002, to replace it. In this new building, the 1st floor was named “ZashikiI-bokko” or a Japanese Tatami-room for being pleasantly idle, and contained a resting area and a small library. The 2nd floor was named “Kakuregumo” or a detached cloud, and it enclosed 7 more private resting areas. Both floors are connected with the main building via a corridor and an overhead bridge. Resting Area of the Okuzashiki. “Zashiki-bokko” is built so its floor slowly descends toward the riverbank, where there is an abundance of steam in the air. Beautiful greenery landscape on the other side of the riverbank can be observed from the Japanese room. You can enjoy fresh air if you fully open the all wide glass windows, as you feel like resting in nature. “Kakuregumo” on the 2nd floor, is built like a circling mezzanine with an opening in the middle, which provides image of sequence, and guest can observe the scenery below. 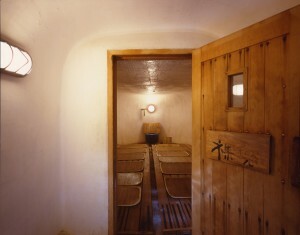 A private outdoor bath is located at the deepest end, and reserved only for “Kakuregumo” users. Thanks to two additional wells, there is abundance of Onsen water available. 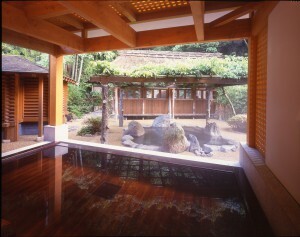 The new private outdoor bath was named “Okunoyu” or remote Onsen. 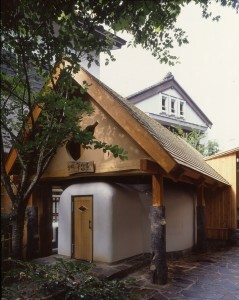 A simple wooden hut structured with bare chestnut tree pillars was built as the changing room. The roof is covered with cedar bark, the veranda has a bamboo floor and only a lattice door is employed as an interior fitting. The Tenzan owner had strongly hoped that the changing room would look like a grass hut. Architect, Mr. Hiroshi Ebisawa understood his good sense. The rustic outdoor bath “Yaten-buro” has no roof and is surrounded by green grass. It is simply laid out in the deep mountain. You really feel something like bathing in nature. Abundance of Onsen water and surrounding nature is just reserved for you. It is a kind of supreme pleasure, isn’t it? Edo-style “My Lord’s Onsen” revived. Lodge Hagoromo & its signboad. The Hotel “Sen-no-mori” opened its Annex guest house. The new gurst house, "Saiou-no-miya." “KAMA-BURO” is still trendy bathing style! Unique bath "KAMABURO" in Hakone Tenzan. Ancient cave-like bath in Hakone Tenzan is quite unique. 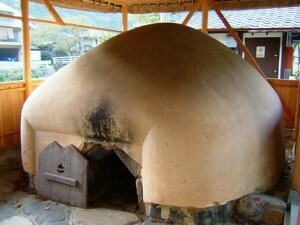 "ISHIBURO" in Kuga, Yamaguchi Prefecture. There are two ways of enjoyment of bathing. “Onyoku” or hot water bathing is one. Another is a sauna form of the steam bath. Original bath in Japan is said to be a steam bath but not hot water bath, which dates back to ancient or even in pre-historical years. The Japanese word “FURO” or bath is considered to be the same meaning of “MURO” or room. The “FURO” or bathroom was actually a small cave with a vent behind. In the old days, a hole that is large enough for a person, were dug into a rock. Branches were burnt inside, and then wet seaweed or straw mats wet in sea water were laid on top to create steam for the sauna. The “ISHIBURO”or stone bath in the Itsukushima Island is typical one among them. It is said that “KOBO-DAISHI”or Great Buddhist Priest Kobo created it. This style of bathing still exists in a few places in the Seto Inland Sea area. Ancient Style "KAMABURO" in Yase, Kyoto. “KAMABURO”or earthen pot bath in Yase, Kyoto is also the origin of Japanese bath in different kind. It dates back to the Battle of Jinshin in 672 A.D. in Japanese history. It is said that Prince Ohama (Later Emperor Tenmu) was wounded by an enemy’s arrow on his back in the battle. He bathed in “KAMABURO” to cure his arrow wound. People says that the name of place 八瀬（矢背）“YA-SE” or arrow-back originated from this event. Modern style "KAMABURO" in Hakone Tenzan. 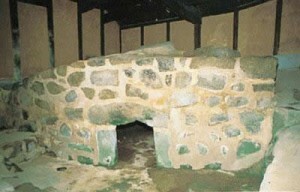 Modern “KAMABURO” is usually made of concrete and plaster mixture, sitting on top heat absorbing bricks. Burner flames heat up the bricks, when then heat up the “KAMA” or a pot. Bathers lay on straw mat placed on the floor in a pot. Occasionally water is sprinkled over the straw mat to maintain the temperature of approximately 50 degree Centigrade (120 degree Fahrenheit), for longer enjoyment. The interior of "KAMABURO" in Hakone Tenzan. This “KAMABURO” process is rarely used now, due to lack of skilled builders. Fortunately, you can still enjoy this time honored bathing style in Hakone Tenzan. Is it considered to be something obsolete style? Answer is no. It is really a kind of simple and natural bathing style, and still very attractive and trendy even in today. As you know, I wrote about fishermen’s Onsen, “TORETORE-NO-YU” in Shirahama, last time. How about farmers Onsen! 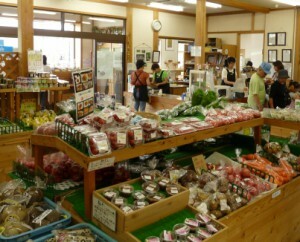 Yes, one of the well known agricultural corporations, “WAGOEN” Group started Onsen business on June 23, 2009. Edo-style “UKIYO-BURO” was revived in Hakone Tenzan. Hakone Tenzan renovated Men’s Inner Bath in 1998. 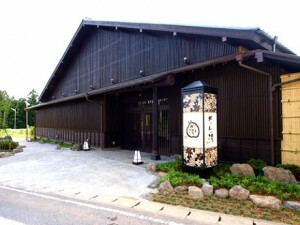 Revived Edo-style "Ukiyoburo" in Hakone Tenzan. The men’s inner bath was redesigned with the similar improvements. An “URUSHI-BURO” or ancient cypress bath tub coated with japan was also employed, here. Actually, the “URUSHI-BURO” set for women’s inner bath could not last long and beautiful color of japan faded caused by ultraviolet rays in less than a year. Learned from this bad experience, experimental trials were done, and finally anti-fade lacquer was developed. The new type of anti-fade lacquer was applied to both inner bathes for men and women. So, now you can enjoy Onsen bathing in a beautiful “URUSHI-BURO” that is finished as the same quality as traditional japan lacquer ware.